Just typical isn't it? Especially if you're a plant lover and spot a bargain! So today we went out in search of several tall glazed pots to go on the top patio. Not finding any suitable ones at a couple of garden centres near us we went further ahead to Savin Nurseries to see what they have at the moment. Now this nursery we enjoy visiting regularly for their reasonably priced plants and ability to spring surprises, to suddenly have some rarities for sale with great prices too. And it proved to be just like that again on today's visit. We may have been looking primarily for pots this time but since we were there we might as well peruse the plant polytunnels. And whilst browsing we spotted them by the corner. 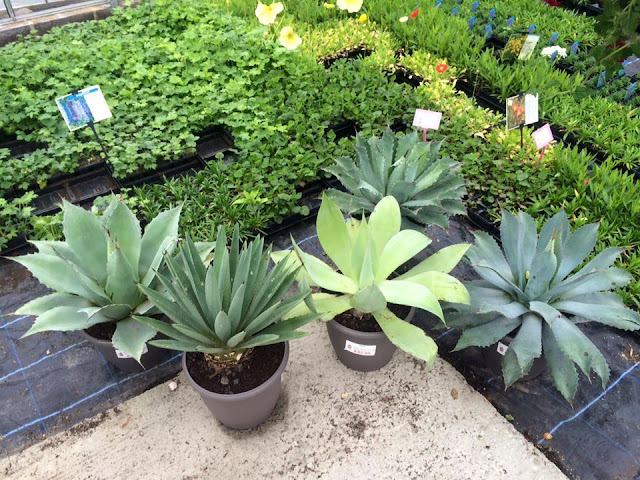 There they were, a group of large Agaves with prices that are very reasonable. 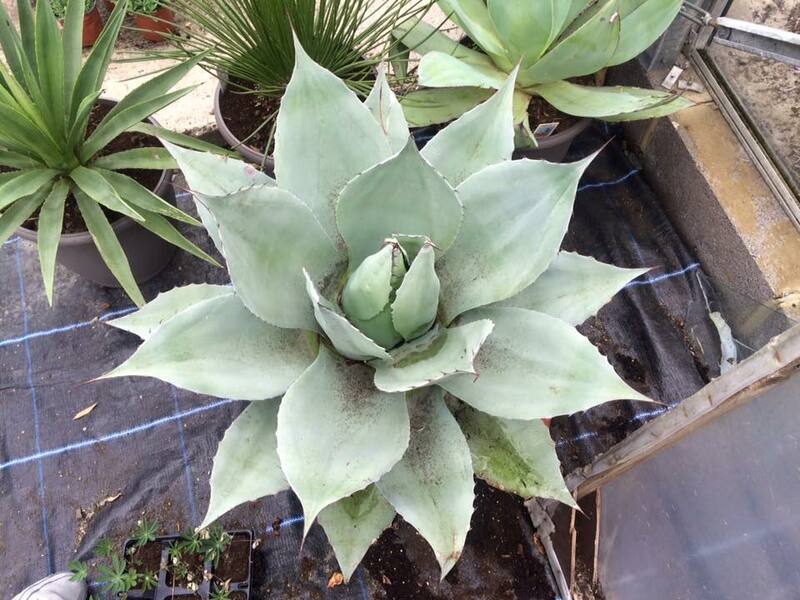 It's still quite rare to see large agaves for sale here so to see them there of all places was an extra treat and a surprise! Which ones should we go for when they are all very nice? There were some minor flaws on all of them due to being transported to the nursery from continental Europe but overall they were in great condition. We didn't have the camera with us so only took photos using my phone. 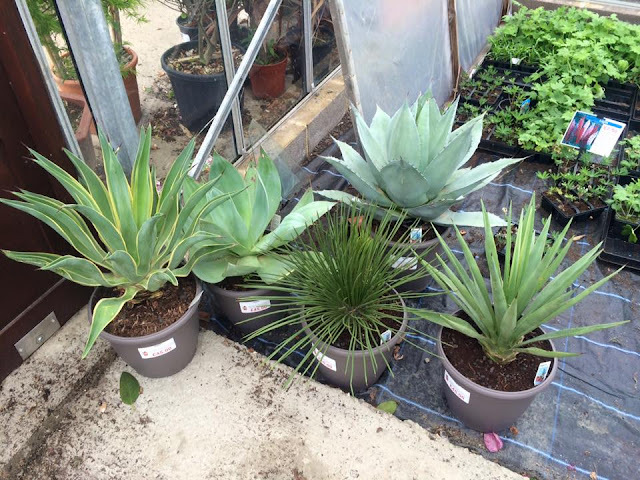 I recognised the agaves as follows: A. ovatifolia, A. potatorum, A. tequilana, A. desmettiana 'Variegata', A. mitis, and A. geminiflora. One of them I couldn't recognise so perhaps anyone out there would hazard a guess? And was the one I went for and took home with me. It is big but the leaves are pliable and would be much easier to shift in the winter. The way it was trimmed for transport and sale it looks more like a Dasylirion at the moment, which is nice in its own right too. So did we buy any pot? Nope, they didn't have what we were looking for either. But that agave more than made up for the effort of going there. Come to think of it I don't think we need but those pots now. All worked out well in the end! Great find. That geminiflora is a beauty. I've never seen one with such a haircut though. It's cool, I must say. Go out for a pot, come home with a plant. I've never done that, except all the time. Nice geminiflora! We're all on the same boat Loree! Like you, Hoover and Danger, I find plants when I am looking for pots and then find pots when I am looking for plants. There is always some deficit which requires yet another trip. This then leads to more potted plants than I actually have room for and since we don't have a green house...my kitchen (thankfully huge) and down stairs bathroom become jungles for the winter (which is thankfully short here in Houston). I am dreaming of a glassed in dining porch : ) Cheers! Sounds wonderful Laurin :) and how true, there's always a deficit that warrants a trip! Who could resist? No one reading this. That's how it works! I can't say I ever stick to my list (even when I have one!) when I go into a nursery or garden center. Nice find with the A. geminiflora! Ohhh! great purchase :)!! I love to find surprises like that, it makes my day!! Great buy! How hard to choose between them all. Finding unexpected plants at nurseries is like being a little kid at Christmas time. I had to laugh as I did exactly the same thing last night. Went to get a simple pot, came home with a car full of plants as well. You need to go back and get the huge A. ovatifolia. I'ts hardy outside as long as it has good drainage. There's always room for another plant! Just cram it in! How about in the front of the house in a huge blue pot? There you could see it every day as it waves you off to work and welcomes you home again! Yes, that is typical. No point in wasting a trip! the geminiflora is wonderful.